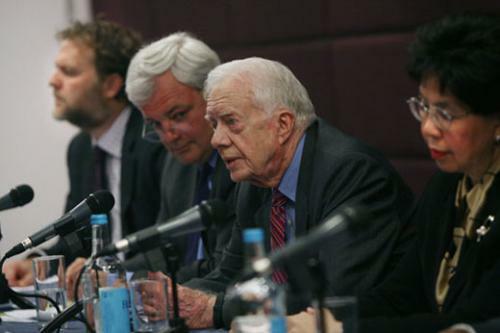 In London on October 5, 2011, former U.S. President Jimmy Carter addressed an audience of international journalists and partners to announce that the Carter Center-led global campaign to eradicate Guinea worm disease has entered its final stage to end this gruesome waterborne parasitic infection. “The poorest, most isolated, most neglected, quite often, the most hopeless people, on earth…now have new hope that their future will be free of this dreaded disease,” said President Carter. 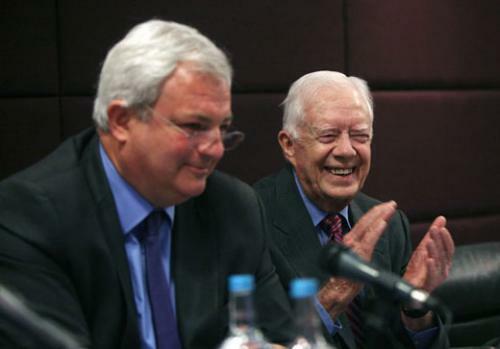 In London on October 5, 2011, former U.S. President Jimmy Carter addressed an audience of international journalists and partners to announce that the Carter Center-led global campaign to eradicate Guinea worm disease has entered its final stage to end this gruesome waterborne parasitic infection. "The poorest, most isolated, most neglected, quite often, the most hopeless people, on earth…now have new hope that their future will be free of this dreaded disease,” said President Carter. Guinea worm disease—which causes agonizing pain and leaves people incapacitated for weeks, even months at a time—once was endemic to 21 nations in Africa and Asia, afflicting approximately 3.5 million people when eradication efforts began in 1986. Today, the disease is poised to become the second human disease, after smallpox, to be wiped out and the first to be eradicated without the use of a vaccine or medical treatment. As the last cases in an eradication campaign are the most difficult and expensive to track, treat, and prevent, the United Kingdom Department for International Development will contribute approximately US $31 million, if other donors come forward, to help end Guinea worm disease transmission before 2015. “Britain is ready to help fund the final push to eradicate this debilitating disease, and we now need others to join us in taking this historic opportunity to rid the world of Guinea worm,” said United Kingdom International Development Minister Stephen O’Brien. Other participants in the press conference included Margaret Chan, Director-General of the World Health Organization, Carter Center Vice President of Health Programs Dr. Donald Hopkins, and Laurie Lee, of the Bill & Melinda Gates Foundation, who commented on the scale of the work achieved until now, and the importance for donors to come together and secure the funds to see this through. This article and photographs are courtesy of The Carter Center. 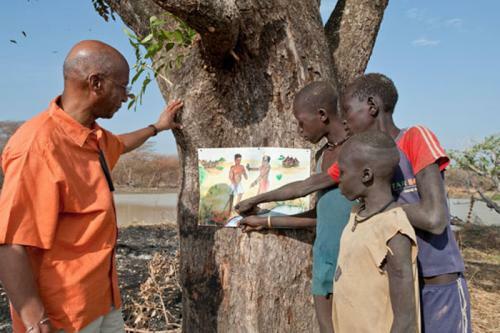 A chapter about Guinea worm disease by The Carter Center authors, Drs. Donald R. Hopkins and Ernesto Ruiz-Tiben, “Dracunculiasis (Guinea Worm Disease): Case Study of the Effort to Reduce Guinea Worm,” appears in Water and Sanitation Related Diseases and the Environment: Challenges, Interventions, and Preventive Measures, a Wiley-Blackwell collaboration with Horizon International. More about Water and Sanitation Related Diseases and the Environment: Challenges, Interventions, and Preventive Measures is available on the Horizon International Solutions Site (http://www.solutions-site.org/node/36). An article about The Carter Center progress with eradication of Guinea worm appears on the Horizon International Solutions Site at http://www.solutions-site.org/node/505. Further information about Guinea worm appears on The Carter Center website at Guinea worm (http://www.cartercenter.org/health/guinea_worm/mini_site/index.html). Health Program Publications at http://www.cartercenter.org/news/publications/health/experts.html. If you wish to Donate to The Carter Center Health Programs including Guinea worm disease and other diseases intertwined with water and sanitation issues, please follow this link to The Carter Center.